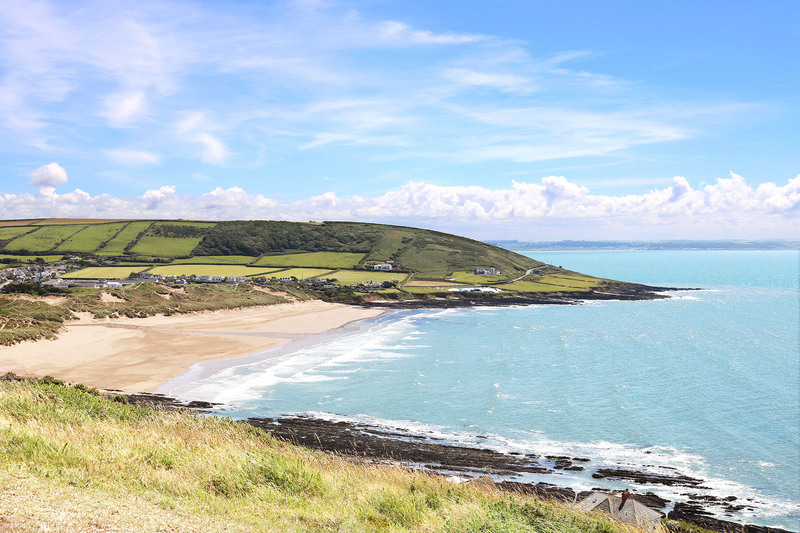 Montague Farm House is a stunning period property located in the heart of the gorgeous village of Croyde, just a gentle stroll away from the glorious sandy beach. The house boasts the perfect combination of old and new, with wonderful period charm mixing faultlessly with modern fixtures and fittings throughout. 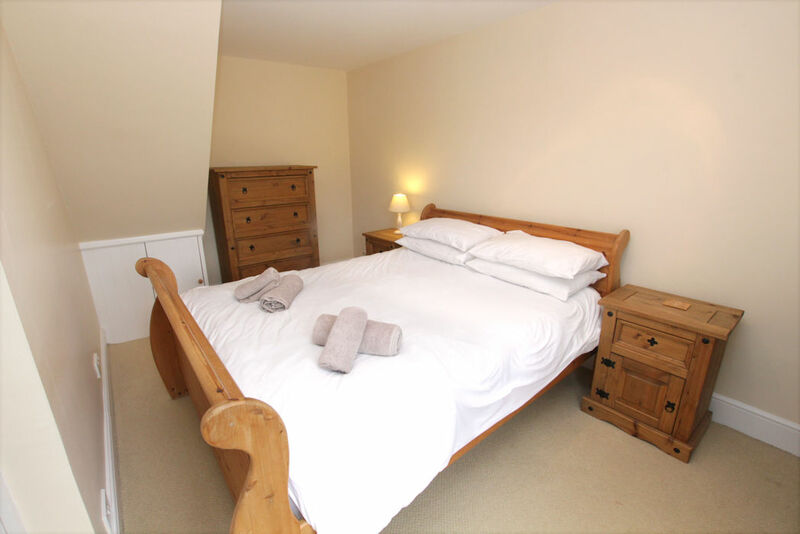 there are 5 good sized bedrooms that provide accommodation for 10 guests with spacious reception rooms and garden for all to enjoy. 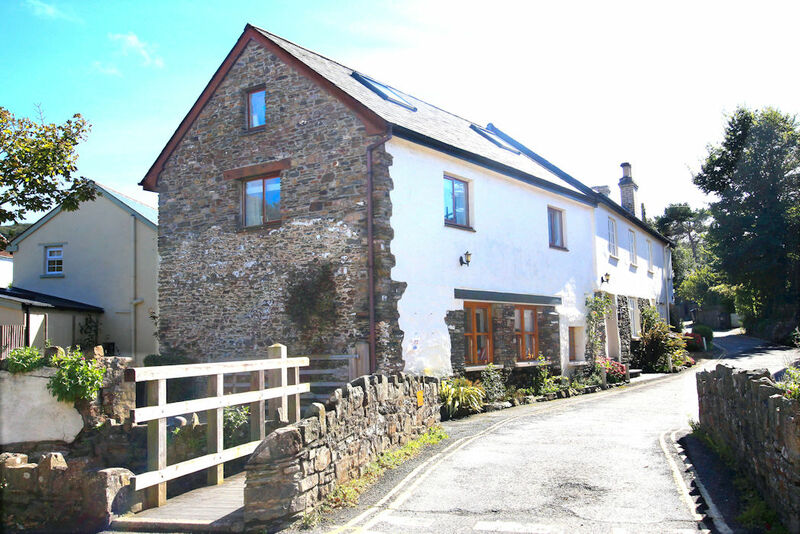 This beautiful house is the perfect solution for those of you who are looking to holiday with family and friends. Offering spacious rooms and relaxing living spaces, you really couldn't wish for a better place to spend your well-deserved break away! 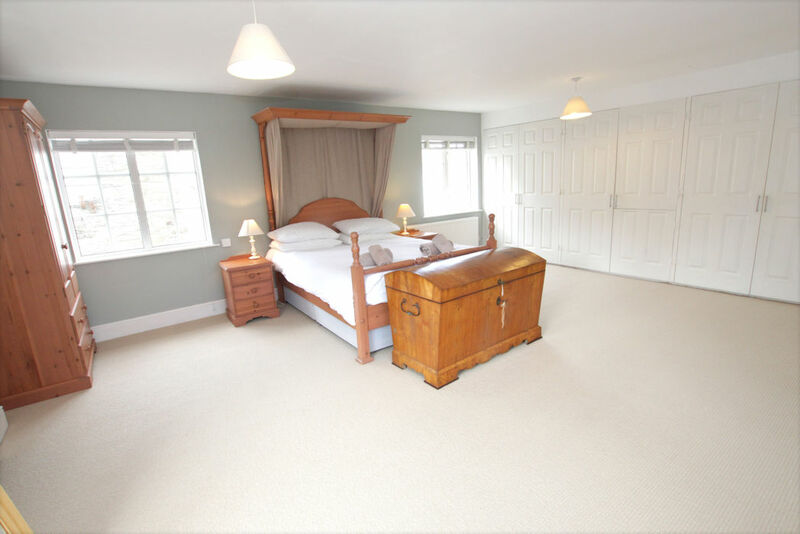 Montague Farm house has all the finer details covered, with newly fitted, luxury bath and shower rooms and a fabulous master bedroom. A little silver lining to this already gorgeous house. 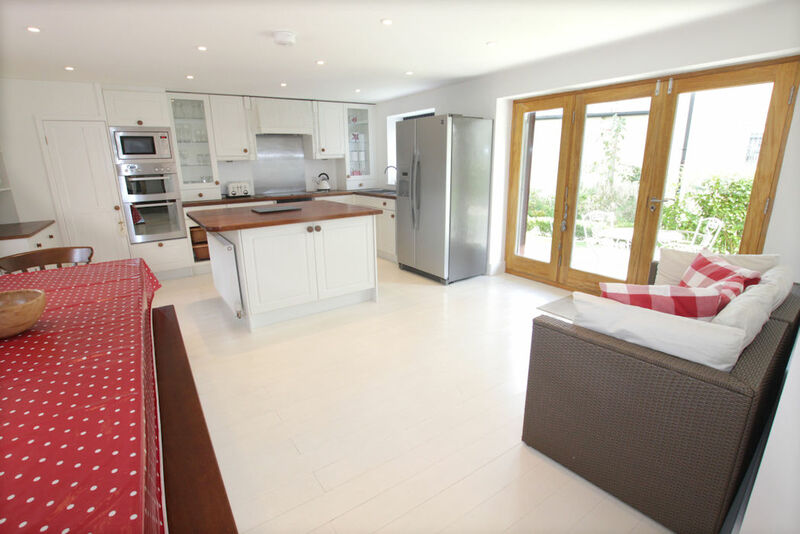 The kitchen of the property is a fantastic size and boasts a contemporary design. 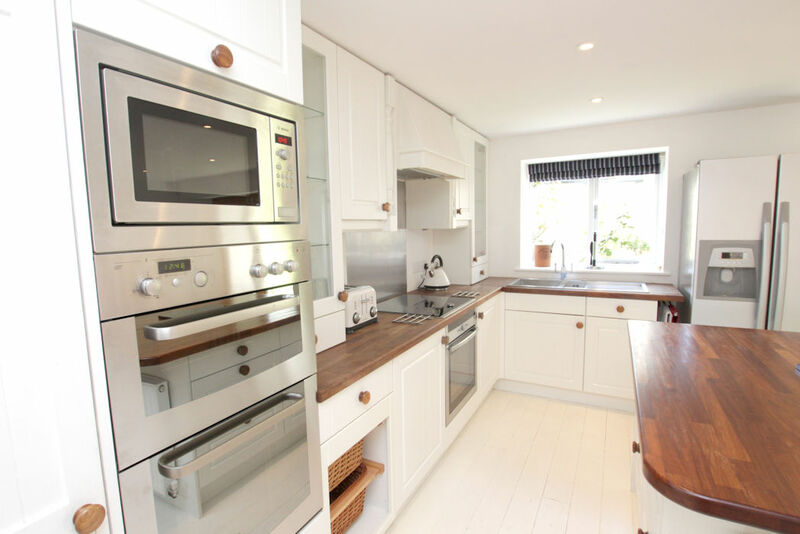 It is fully equipped with all modern conveniences, including a large American fridge/freezer, electric oven and induction hob. 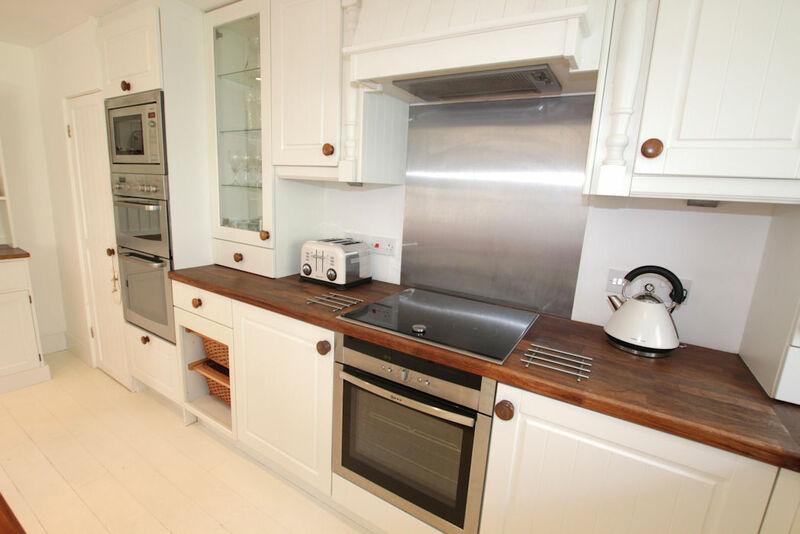 There is ample space for cooking and dining, with a solid wood breakfast table and bench seating for guests to sit and relish some tasty local produce. 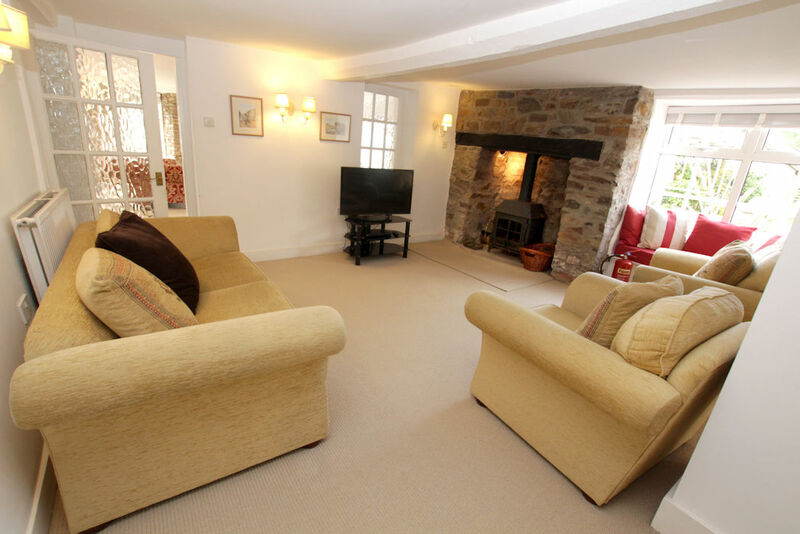 There is also a relaxing sofa area for you to utilise should you wish to put your feet up and let someone else cook up a feast! 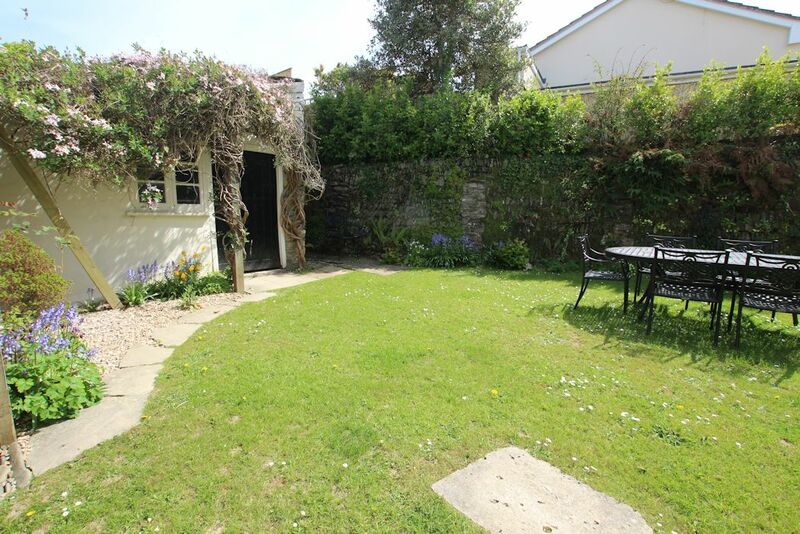 From this lovely room there are bi-fold doors that lead out onto a sunny courtyard area with a table and chairs- this is the perfect space for indulging in a peaceful morning coffee before you start your busy day exploring North Devon. Also off from the kitchen you will find the incredibly useful utility room, housing a sink, dishwasher, washing machine and further storage for your belongings during your stay. A great little room for coats and shoes that leaves your living space clean and clutter free! 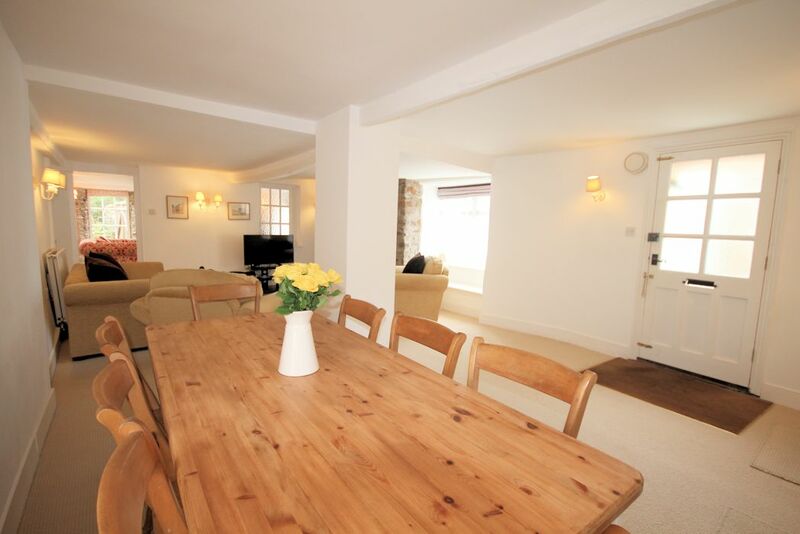 Montague House has a charming dining room that provides table and chairs for 8 people. A great location to hold an evening dinner party where you and your guests can chat, reminisce and enjoy an evening of fun and laughter. 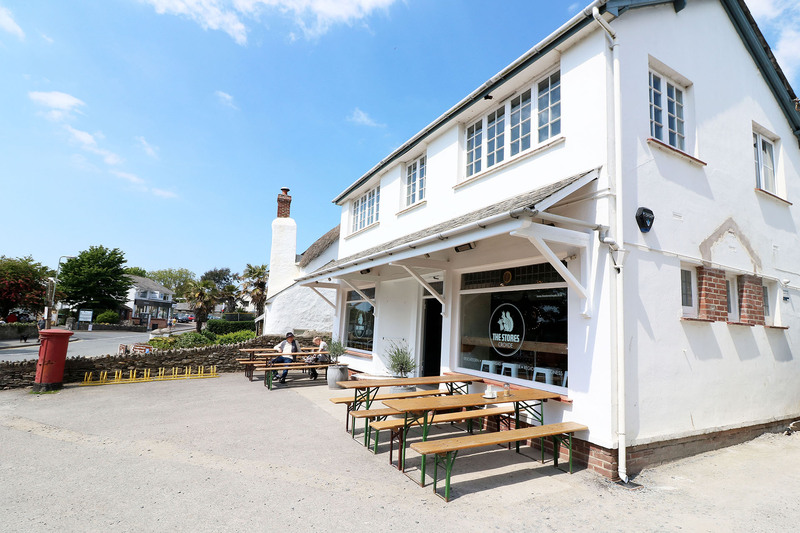 There is also a separate seating area with an abundance of comfortable seating, flat screen TV and enchanting log burner for those colder months of the year! 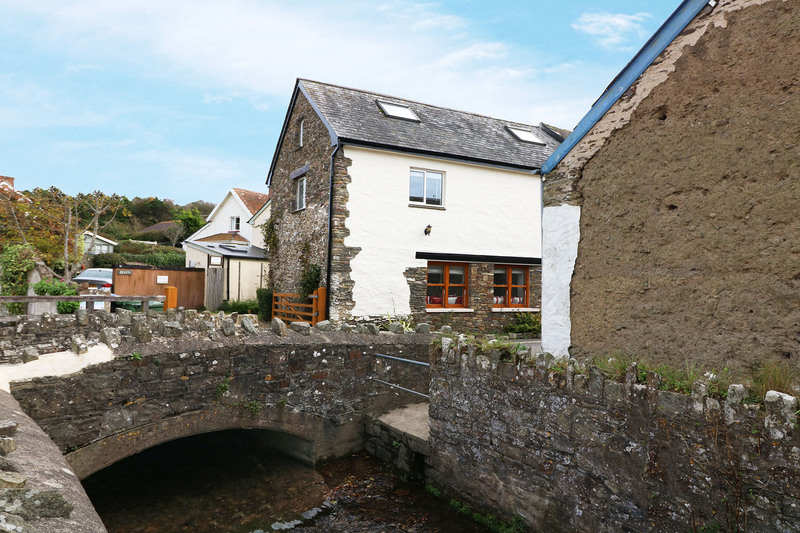 A fabulous and much appreciated feature that adds a cosy, warming atmosphere to the property after wintery days on the coast. 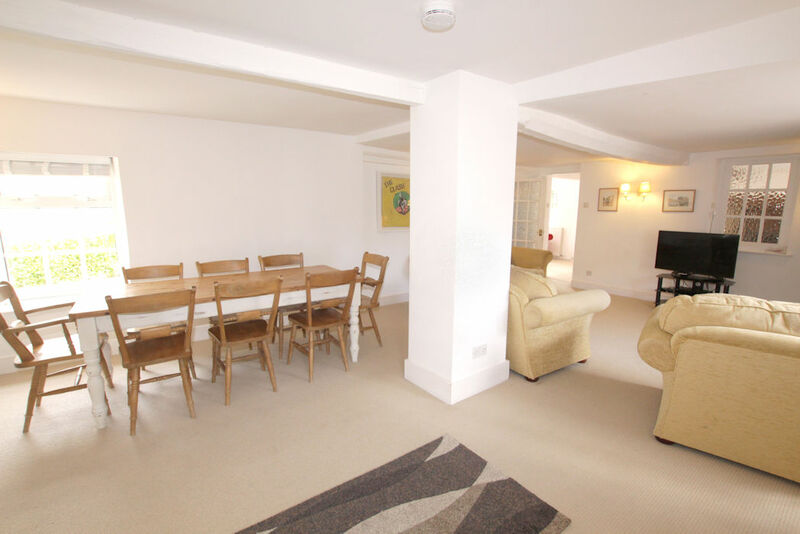 The ground floor living space has a separate sitting room that provides restful seating for 8 - 10 people with an attractive feature fireplace (unfortunately not in use) and a flat screen freeview TV and DVD player- perfect for keeping the little ones entertained between activities! 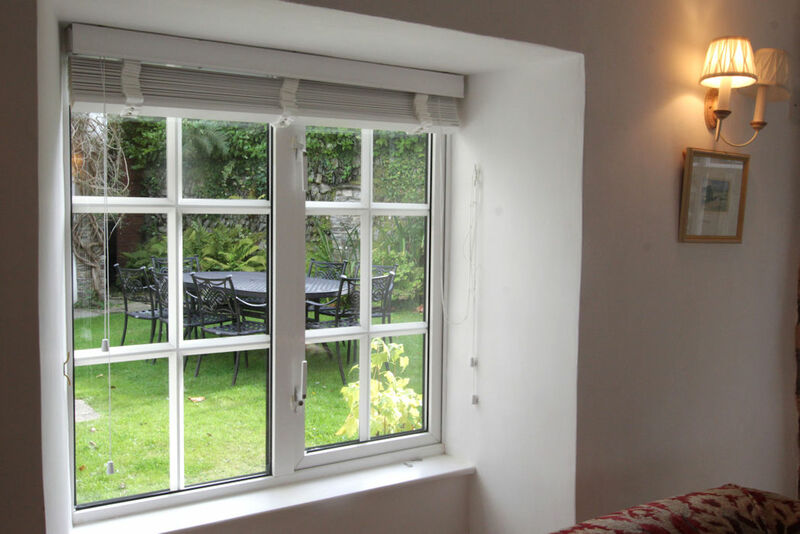 This room has the benefit of overlooking the garden and you may be lucky enough to spot some of the local wildlife paying you a visit during your stay. 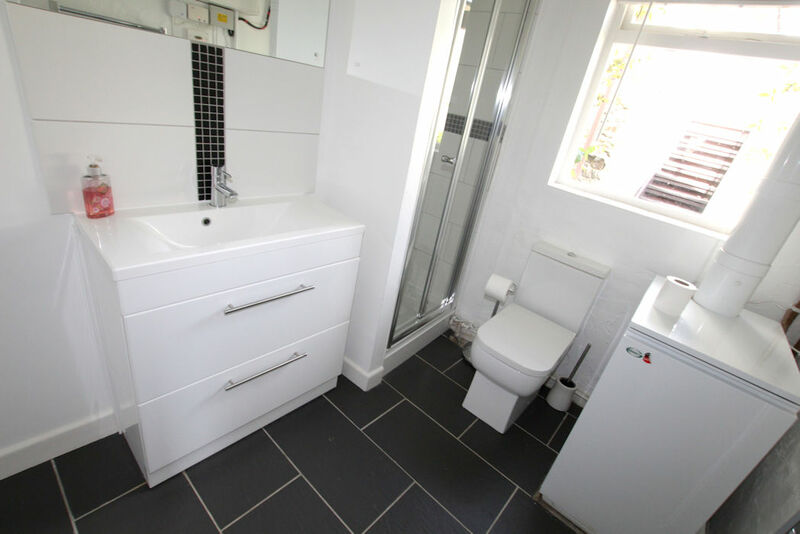 This floor is finished with an incredibly handy shower room that has been decorated in a modern and contemporary style with shower, wc and vanity unit. 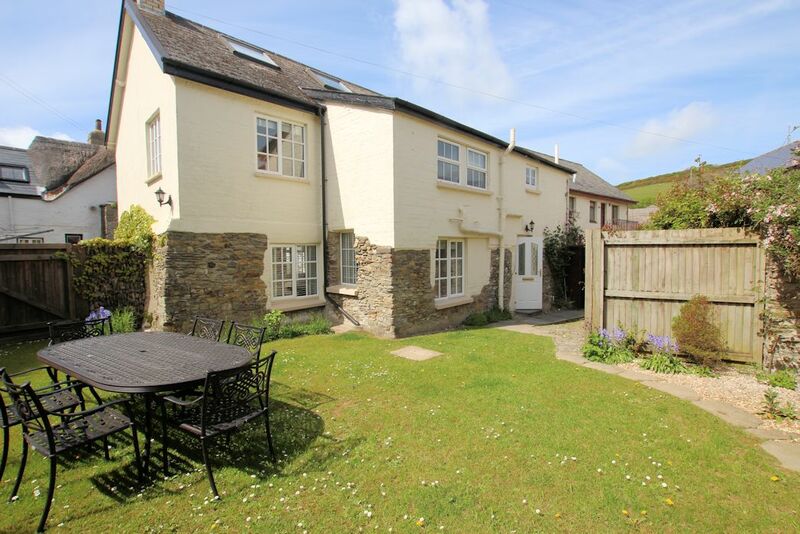 You will find that this is an invaluable asset to the house and great for washing off after busy days on the beach. To the first floor you will discover the large master bedroom that offers a king-size canopy bed for the ultimate luxury sleeping experience. There is a bank of built in wardrobes with ample hanging and storage space for your belongings, no need for suitcases to be left unpacked! The room is fresh and bright and guarantees to provide you with the perfect morning positivity that you need whilst on holiday! 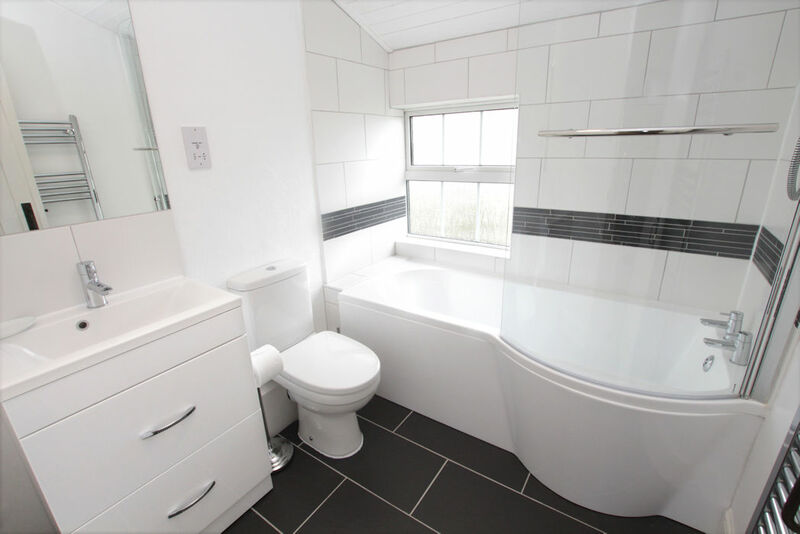 There is a luxury en-suite bathroom with shower over the bath, wc and sink vanity unit, therefore meaning that you have the added bonus of being able to get ready with ultimate ease. 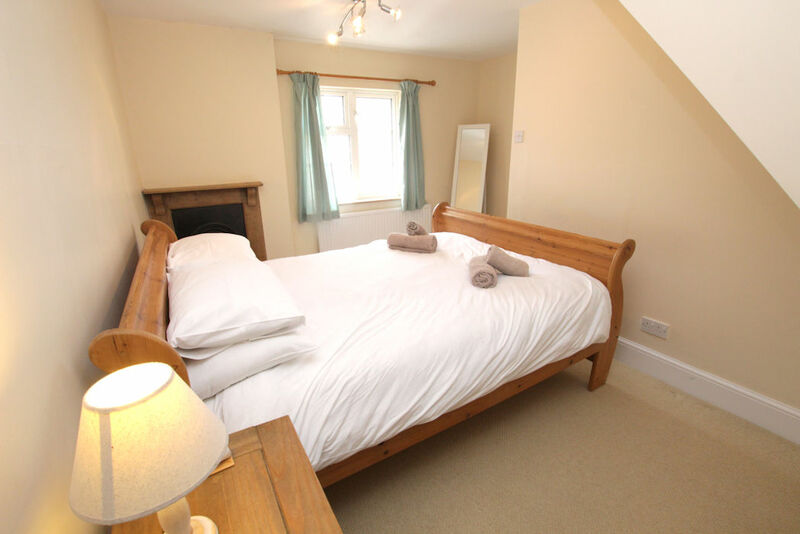 Also on this floor you will find a spacious double bedroom, again possessing a lovely, crisp décor throughout. There is drawer storage in this room and a free standing mirror- perfect for testing out an outfit or two! 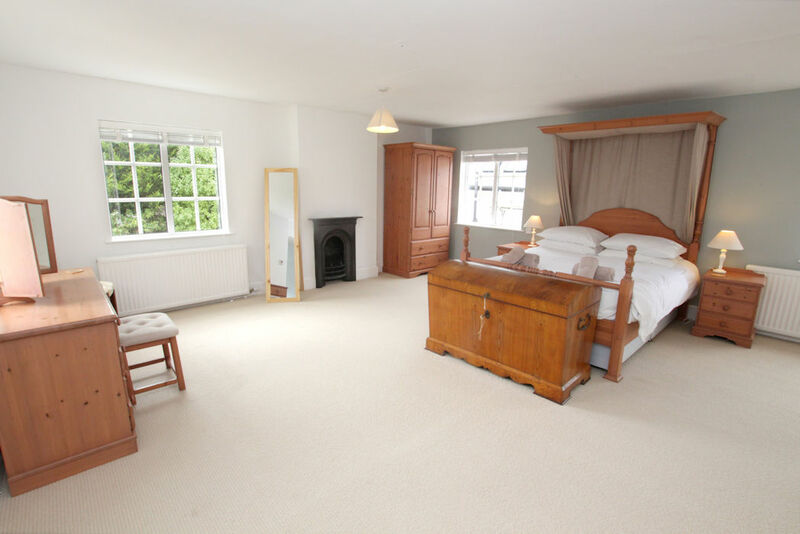 The twin room is a good size with a large window providing lots of gorgeous, natural light. There is some bedside storage and a table lamp for enjoying a good book before bedtime. 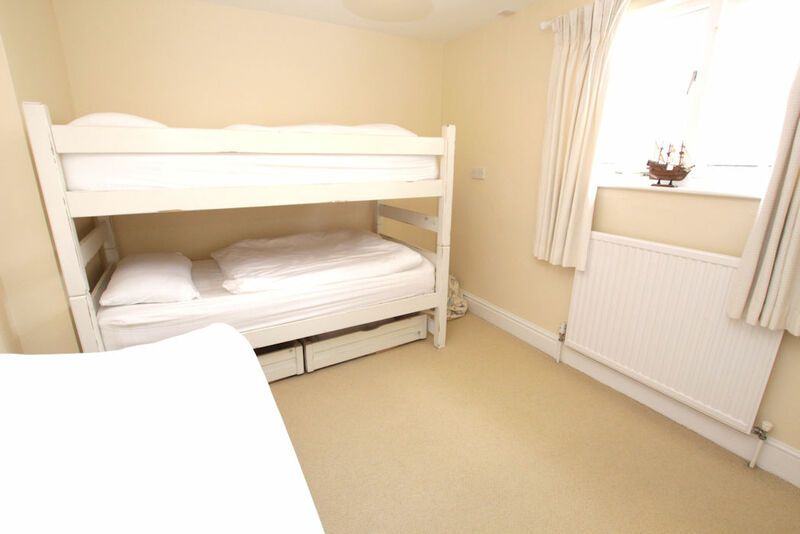 The bunk bed room provides bunk space for two people and extra sleeping space by use of an additional single bed and a pull out trundle bed if required; please note that this is only suitable for a child. There can be 4 people in total in this room and extra charges may apply. The now newly refurbished and luxurious family bathroom has a bath with electric shower over, wc and sink vanity unit. The modern fixtures and fittings are of a high quality and you are sure to enjoy plenty of relaxing bubble baths and warming showers during your stay- a great place to relax and unwind at the end of a busy day. As an added bonus you will find an additional W.C room with sink also on this floor. 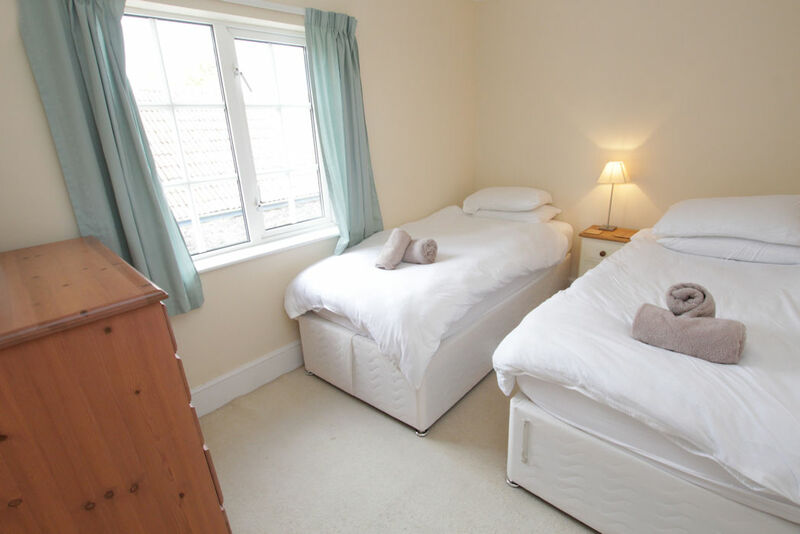 To the second floor there is a delightful children's twin room with TV for the little ones to use at their leisure. All bases are covered and we guarantee that you'll find this wonderful house a real home from home. Outside there is an enclosed garden with wooden table and chairs and a coal BBQ for guests to use when the weather is fine. 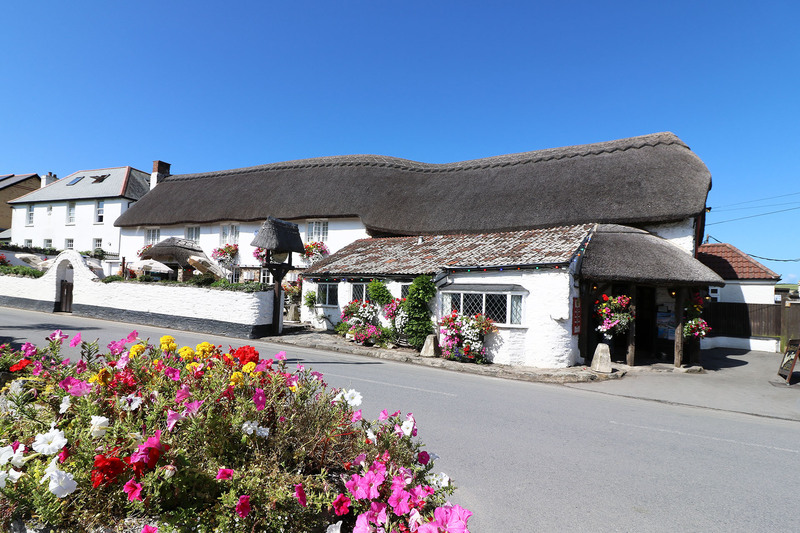 What better way to enjoy the glorious North Devon sunshine than a little al fresco dining- a glass of bubbles in hand! 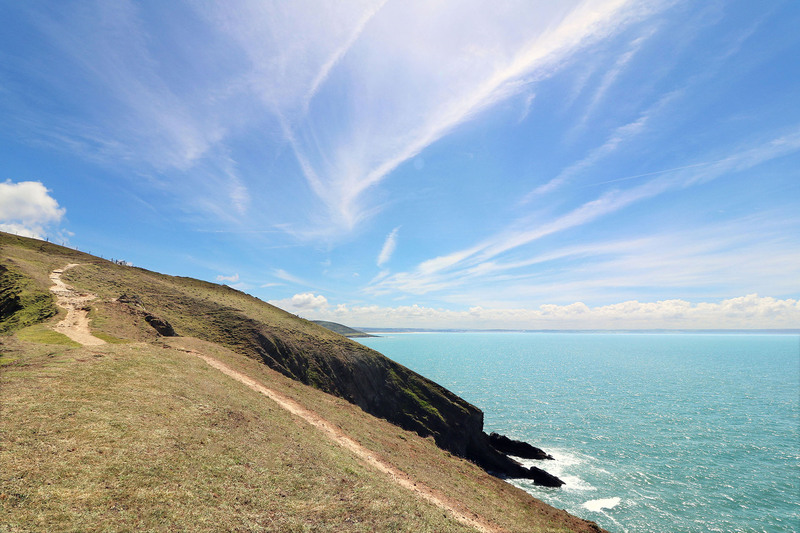 There is a good amount of storage for bikes/surfboards so please do bring them along if you fancy exploring the coast from a different perspective. Parking is suitable for 1 large or 2 small cars. 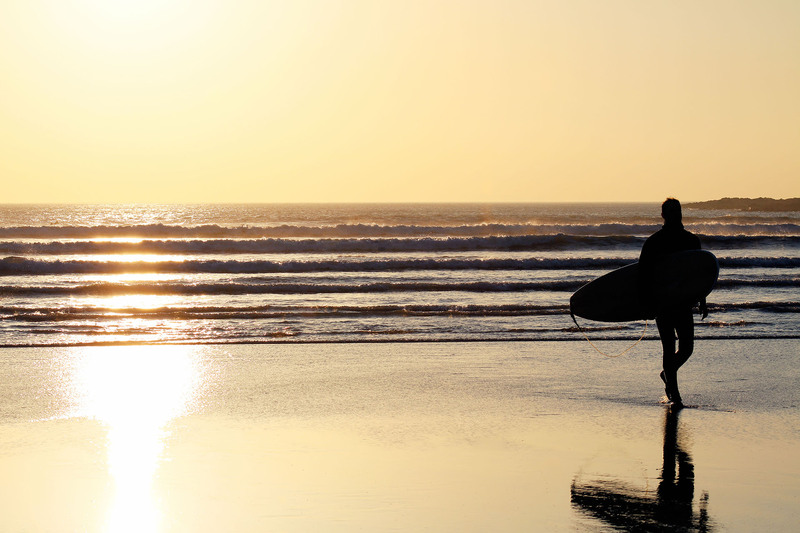 Book today to avoid disappointment and guarantee your slice of a luxury lifestyle in a superb location! 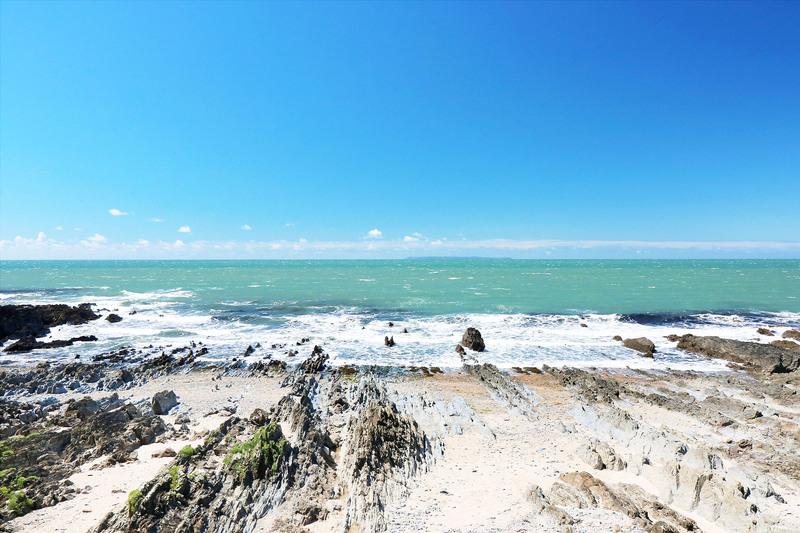 Please note: this property does not accept all adult groups and bookings must include children under the age of 18. 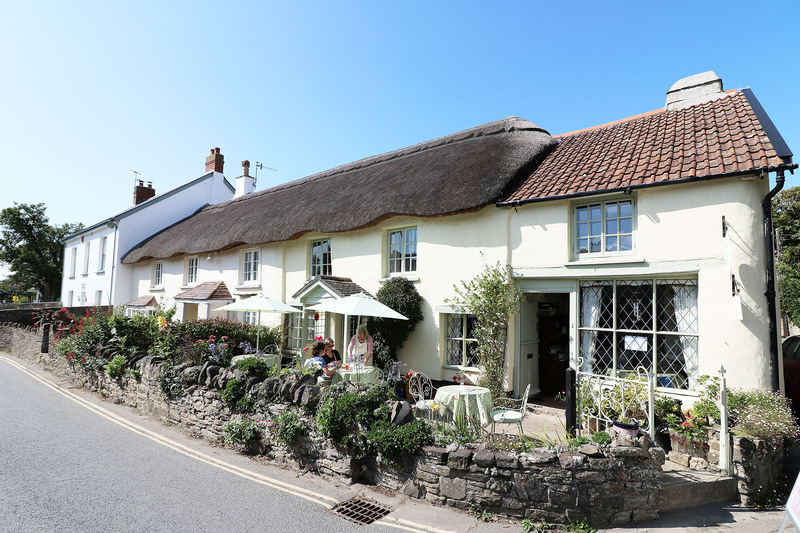 Montague Farmhouse is brilliantly positioned right in the middle of Croyde village; 50 yards to the coffee shop, stores and post office and 100 yards from the shop and pub. 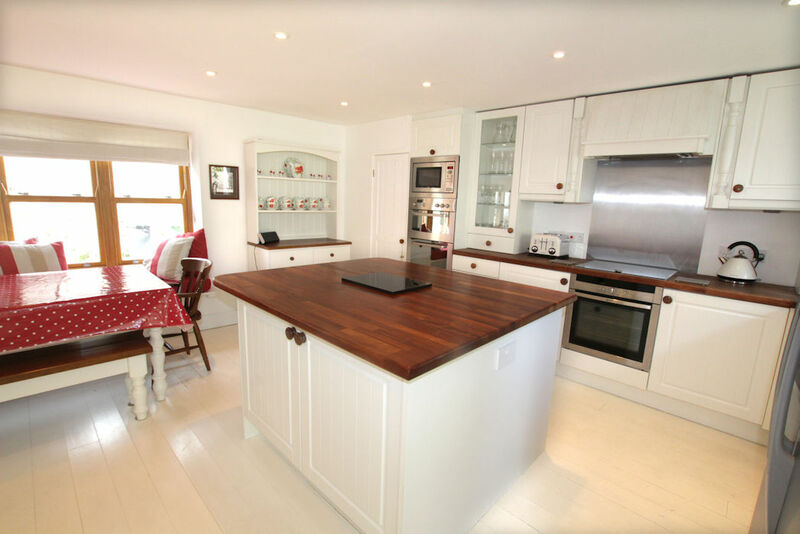 We were a three generation family of 10, and the house was really comfortable with a superb dining kitchen and two lounges. Only a 10-15 minute walk to the beach, which meant we hardly used the cars at all. A fab week with lovely friends - this time next year - see you again!